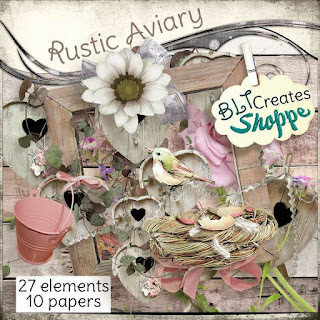 Gorgeous new Rusti Aviary kit for BLT Creates. This is a freebie! BLT Creates offers a freebie every first Friday of the month, #FirstFridayFreebie. It is available exclusively for BLT Creates' fans at her Facebook Fan Group. Unlimited specials are relaunching. And all BLT's kits are available to the Fan members for $1 with coupon available ONLY at her Fans Group.